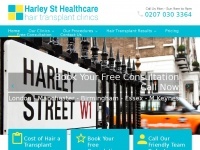 Harley Street Healthcare is leaders in the field of hair restoration. All of Our clinics are located in the UK's most exclusive and prestigious locations including Harley Street, London's premier medical, Mayfair, King Street in Manchester and Birmingham's Victoria Square. We use scientific innovations to serve our patients with compassion and adopt a patient centered approach based on results. A total of 2 reviews for Hair-transplant-clinics.co.uk have been written yet. The most recent reviews are listed below. Great services at the best price!! Harley street healthcare is the best clinic in London, I will recommend this clinic for those who looking for quality hair transplant services. Very friendly, clear and precise. No salesmen up selling anything, just honest advice and details about the hair transplant procedure.